Это человек, который получил премию за популяризацию науки. Doctor of Physical and Mathematical Sciences, Senior Researcher, Institute for Physical Problems. 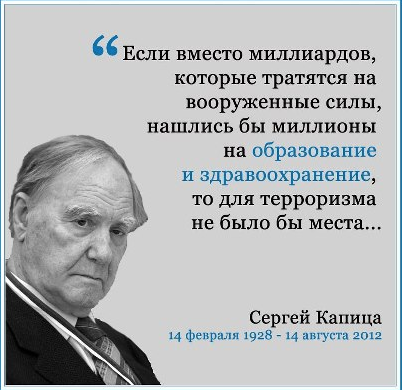 P. L. Kapitsa, Professor, author of 4 books, dozens of articles, 14 inventions and 1 opening. The creator of the phenomenological mathematical model of the hyperbolic growth of the population. For the first time demonstrated a hyperbolic population growth to 1 g. n. e. Honorary Vice President of Engineering Sciences, President of the Eurasian Physical Society, member of the European Academy of Sciences, member of the Presidential Council for Culture and the Arts. Человек, про которого упомянули даже на австралийском телевидении. Недавно увидела заголовок, "Sergei Kapitza, Editor of Scientific American’s Russian Edition, Dead at 84". Занимался экстремальными видами спорта: управлял самолётом, в 1967 году в окрестностях Сиднея спускался в одну из глубочайших пещер Австралии. Великий был человек. Светлая память.